Oh, so you bought a high-speed Gentle Typhoon. Was it the 3000 RPM AP-29, the 4250 RPM AP-30, or did you get really daring and go for an AP-31 5400 RPM “Gentle” Typhoon? I have an AP-30, and it’s not a quiet fan. What if you want to control the speed of your high-speed Gentle Typhoon fan? Maybe you’re tired of it going full-blast all the time. It is quite noisy after all… What can you do? You could buy an expensive fan controller, but there is a better way. Actually, there are a couple of better ways, and they involve a hidden capability of your high-speed Gentle Typhoon’s PCB. My attention was riveted when a user in another forum casually mentioned a PWM mod. What PWM mod? I asked. Oh, the one you can do on all the high-speed GT’s, he wrote. And I was off. 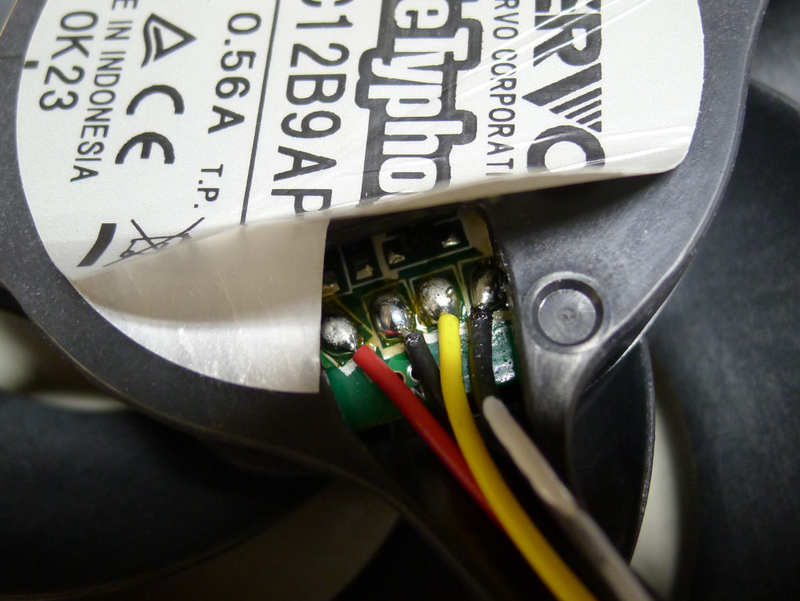 I peeled back the label on my AP-30 and saw four daubs of solder in a row, and only three wires going to them. Excited now, I started warming up my trusty old soldering iron. 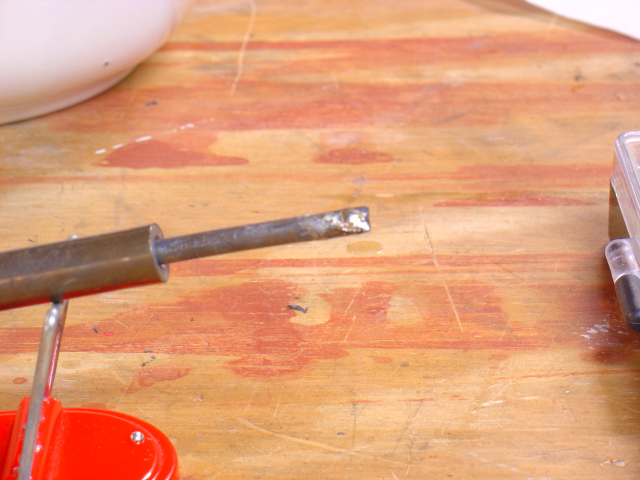 Your soldering iron need not be fancy. Mine doesn't even come to a point. The wire over on the right — the black one daubed with white paint — is the PWM line I added. I only had a black wire available, so I had to improvise. Unfortunately, this won’t work with low-speed Gentle Typhoons, no PWM on the PCB. Now this fan can be controlled directly by the motherboard’s CPU fan PWM header. When the CPU idles, the fan is quiet. When the CPU loads up, the fan speeds up. 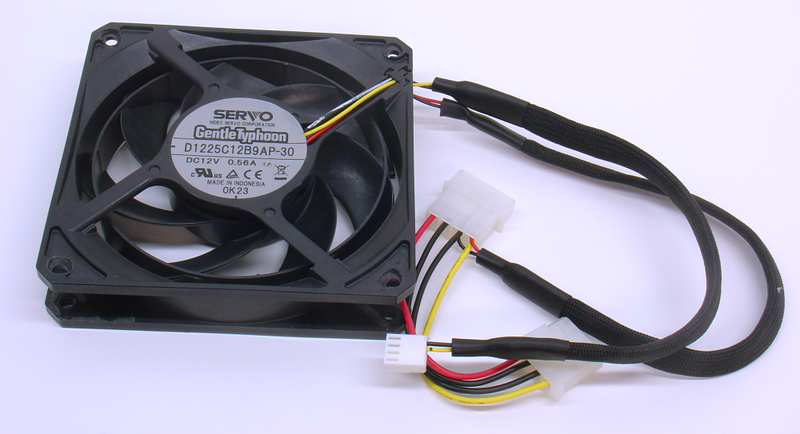 You can also connect this fan and others with a 3-fan or 5-fan PWM Splitter. Another way to control the fan is to hook it up to a Zalman PWM Mate (see my review), which controls any number of fans by PWM. Various vendors carry the high-speed Gentle Typhoons. You can get a 25 Watt or 40 Watt soldering iron at Radio Shack, Home Depot, or any number of places. Get one with as short a shank as you can. I found the Radio Shack irons to have their tips too far from the handle; they would be difficult to use. The wire is 22 gauge. If you have a spool of it, you’re on your way, if you know how to crimp pins. Female pins for fans can be found here, here, and here. You can get a crimp tool here. If you go this route, be sure to look at this tutorial. Be sure to buy lots of extras so you’ll feel free to learn how to do it. Another way to get an extra wire with a pin on it is to simply buy a plug with wires in it, and then use one of the wires. 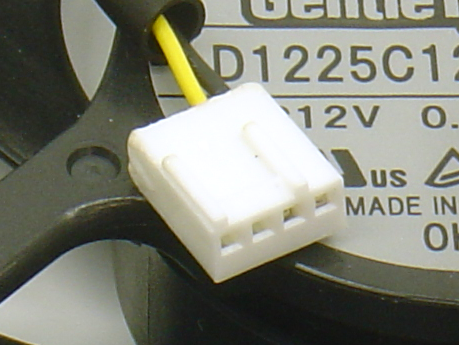 For example, here is a 3-wire fan tail. 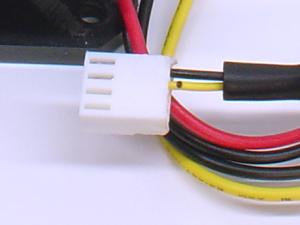 This particular item comes with a white wire, so it would be perfect for your PWM wire, since your other wires are black (ground), red (12 Volts) and yellow (tach). You can also buy an inexpensive 3-wire extension cable for fans (example). Simply cut the wire near the male end (the one with the points) and extract it from the female plug. 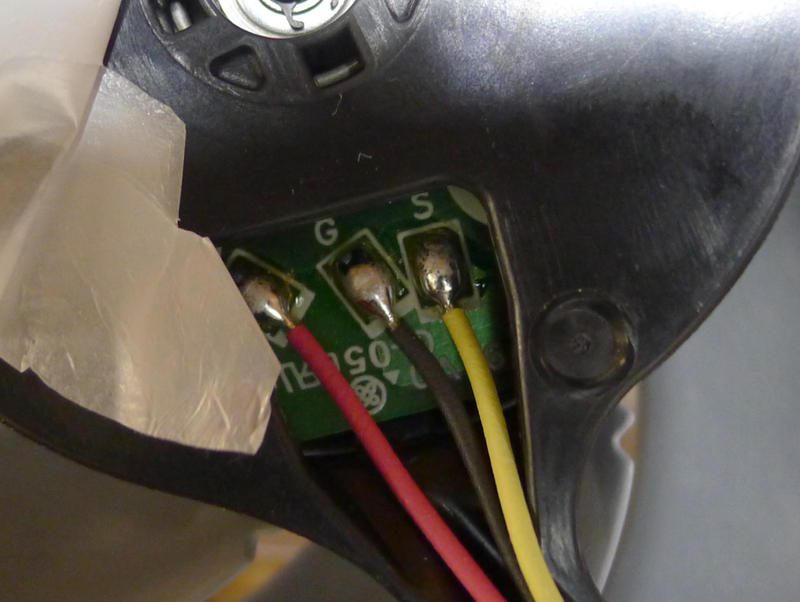 NOTE: to extract a pin from a plug, push a small screwdriver into one of the slots and pull the wire out. Now you have a wire with a pin crimped to it. Finally, you need a PWM plug. A diagram from Molex is here. I bought some from here, but those are expensive. I found a cheaper source here. Find the unused solder spot. On the AP-30 it is the last in line. On the AP-29 it is one of the other spots. Strip about 3 mm of insulation off the end of the wire. Warm up your soldering iron. Put the end of the wire on the unused solder spot. Put the soldering iron on top of the wire. Leave it there. The idea is to make the wire so hot that the wire will heat the solder spot and melt its way in. Lift the iron while holding the wire steady for a few seconds. Give the wire a tug. If it stays on, good. If not, try again. Inspect your work. Make sure there is no solder bridge to any other element on the PCB. Now insert the wires into the PWM plug. Previous Article G.Skill DDR3-2666, EVGA SR-X, Z77 Boards @ CeBIT - Plus Ivy Bridge! Great write-up but why didn't you just have all the wires go to the mb? Can handle more power if the mobo only does pwm, and the power comes direct from the psu. Mono fan headers have an amperage limit, and some fans would blow them up. Not sure why he did it his way. This is just what came to mind. Yep, that is exactly why he did it that way, IMOG. You go putting high powered fans pulling their juice from the mobo headers and the next thing you know, you have just cooked a fan header. I personally don't like to connect any fan that pulls more than an amp directly to a motherboard fan header, even though the manufacturer might say it's rated for higher. Startup current can be twice the running current on these fans. Exactly. Look at Nidec's specs here (pdf). Startup current on the AP-14 is 210mA, where the running current is 49mA. The AP-15 runs at 83mA, starts at 190mA. But then look here. The 3000 rpm GT runs at 0.22A but needs 0.97A to start. The 4250 rpm GT runs at 0.56A but needs 1.35A to start. The 5400 rpm GT runs at 1.14A but needs 2.69A to start. Gigabyte headers nominally support a current draw of 1 Amp. My As.s board will allow 2A. YMMV, but I'd say you could power a bank of the highspeed GT's from Molex where your mb would fail. Normal highspeed GT's usually involve the mb only in reporting their rpm. Scythe is nice to include the wire and plug for that. The PWM puts the mb back in the action to control fanspeed. Well, you can see how I set mine up. Highly recommended. Does this work on the ap15? You say it doesn't work on the low speed ones, but where do you draw the line of low vs. high? Only the ap29, ap30 and ap31? I also wonder how slow and quiet can you get them? So, will a 5400 rpm fan on pwm turn down as low as the 3000 when set with the same controller? I suspect that with pwm, you can take them down to a certain percentage and they will not start, but it seems like they may work at a lower speed thatn they would do on a voltage type controller. I have never played with Pwm stuff. You are right. I recently tested an AP-29 that I converted to PWM. At 0% PWM duty it ran at slightly more than 1200 rpm. Bump and thanks for a good guide. I got 4 ap29s running pwm. I have the pwm plugged into the mobo's fan header and the fans seem to run about 2600-2700 rpm when rig is at full load cpu and gpu's. I can't comment on noise due to the mining rig on the shelf above, but that will be moving soon. 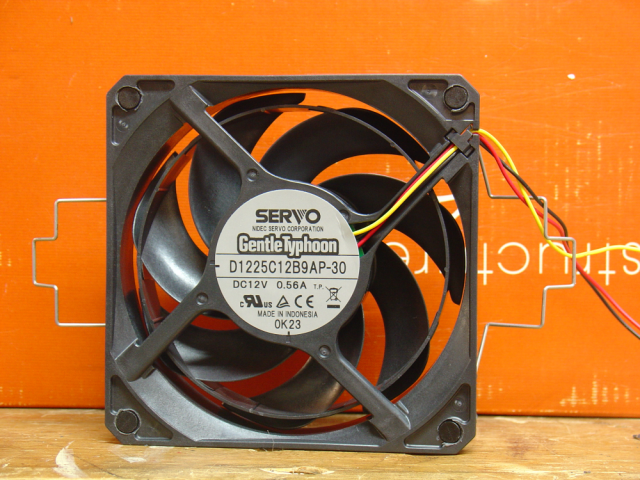 What is the lowest and the highest RPM can you go for gentle typhoon AP-30 4250 rpm pwm? I have mod my AP-30 to a 3 pin connector so I could plug it and control the RPM through my motherboard and it goes from 1650 RPM to 4050 RPM. I just want to know if I should go for the PWM route for lower and higher RPM. Because these fans have high power demands. Motherboard fan headers are usually rated at 1.0 Amp. AP-30 is only rated at 0.56 Amp. I also tried connecting two AP-30 in one motherboard header both of them run at 3950 RPM but that is just for testing I really don't want to fry my motherboard. PWM is the way to go and it create less stress for my motherboard.